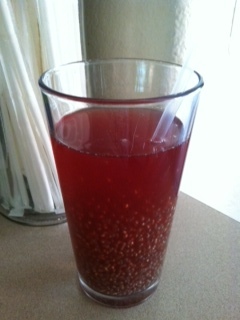 Chia Fresca has proven to be one of my favorite ways to stay hydrated in the hot Arizona desert. Yes, it’s still hot here! I mix 1.5 tablespoons of chia seed in a quart mason jar then fill with water. Place a lid on the jar and give it a shake. Let it rest for a few minutes and give it another shake to minimize clumping (If I forget to shake it twice now, I can always shake out the clumps prior to serving.) Place jar in the refrigerator. Here’s my routine. Each day I shake the Chia Fresca jar then pour a cup into a glass. I either drink it as is or I add Bai5 to dilute and add flavor. I place the jar back into the refrigerator. When I’ve poured my last serving a few days later, I prepare the next batch. Easy and wonderful! Do you eat (or drink!) chia seed? If so, I would love to hear how. What are your favorite beverages? DIY Chia Seed Pudding – Plus 8 Flavor Options!